Description: PACE, NASA's upcoming strategic climate continuity mission is due to launch in 2022. 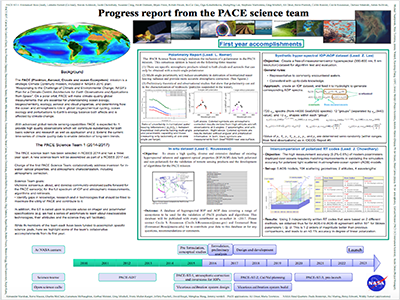 PACE will have a hyperspectral radiometer spanning from 350 to 800nm, several SWIR bands, and a polarimeter, allowing it to be used for studies of ocean biogeochemistry as well as to study clouds and aerosols distribution and microphysics. In anticipation to the launch, a Science Team was competed for and assembled who is tasked with working on algorithms to retrieve inherent optical properties and on atmospheric correction. The team members work on their scientific funded projects as well as collaborate with other team members on common tasks such as datasets assembly and providing recommendation to NASA headquarters regarding potential characteristics of the satellite sensors. Following the release of the ST's report, the team's activities will cease in Sep. 2017, by which time a subsequent ST will be assembled to address calibration/validation of PACE. In this talk we will summarize the activities completed by the science team in its first year, present preliminary results, and discuss knowledge and data gaps identified by the team to date.